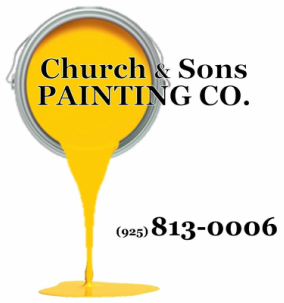 Here is Church & Sons "Top 10 Basic Painting Safety Tips". This handy sheet gives you pointers such as making sure you have good ventilation when painting or keeping your kids, pets and expecting moms safe during painting projects! You know, the simple things we forget cause we're excited about our projects. Keep this with your painting supplies so you'll have it handy. Or better yet call Church & Sons Painting Co. for all your home improvement painting needs! This morning I’m taking some time for myself because I need to touch up a room I’ve rented out. Since I’m just freshening up the room I want this project to be quick and clean. Here are a couple of tips to help make your small project an easy clean-up! Take a close look at my roller pan. It’s lined with a couple of Safeway grocery bags. When I’m done rolling I’ll have a super easy time cleaning up. I just have to remove the plastic bags by turning them inside out. The pan will remain spotless and I’ll be able to use it again. Now take a look at my brush. It’s wrapped inside a sandwich bag. Keeping the brush in the sandwich bag prevents it from drying out and keeps my brush moist with paint. A moist brush will ensure a smooth finish. Plus a wet brush is always easier to clean. Brushes are expensive. There’s no saving a dried up brush. So there you go!.. a couple of simple tips to help make your clean up quick and easy. Here's a perfect example of a painter taking a shortcut. This painter used semi-gloss paint over semi-gloss! Simply stated if it doesn't adhere it won't stick. All it takes is to brush up against this paint job with keys or lean against it with the metal buttons on your jeans and it will peel away. I stripped this coat of paint with my fingernail. My customer was shocked! From this point you can strip away this paint like a banana peel. A painter charged my customer for this poor workmanship. This trim should have been primed with a quality primer. Church & Sons promises a first class prep job which includes priming everything to ensure adherence and long lasting results! Absolutely no shortcuts. If you're gonna do it.. do it right. Or call Church & Sons Painting and we'll do it right! WE DON'T PAINT YOUR L﻿IGHT FIXTURES! 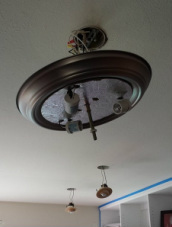 Painters who carefully paint around light fixtures get paint on your light fixtures! That's the wrong way. Church & Sons removes the fixture so it remains clean and spotless of paint. That's the right way! Call Jeff at 925-813-0006 and I'll paint your space the right way! WE'LL EVEN CHANGE YOUR OLD YELLOWED OUTLETS! DON'T THROW AWAY YOUR PAINT! You know that stick the paint store gives you to stir your paint. Okay.. remember that stick. Did you know there are 16 cups in a gallon of paint Did you know a gallon of paint cost as much as $65 bucks? That means we’re paying up to $4.05 for a cup of paint! Wow.. paint’s expensive! So remember that stick? When you’re done with your roller use that stick to squeegee excess paint from your roller. You’ll be amazed how much you can save. You can use that extra paint for touch up. In this pic I squeegeed out ¾ of a cup of paint! I would have throw out over $3.00 worth of paint. So there you go. Another money saving tip from Church & Sons Painting! WE WON'T PAINT YOUR BRICKS UNLESS YOU WANT US TO!